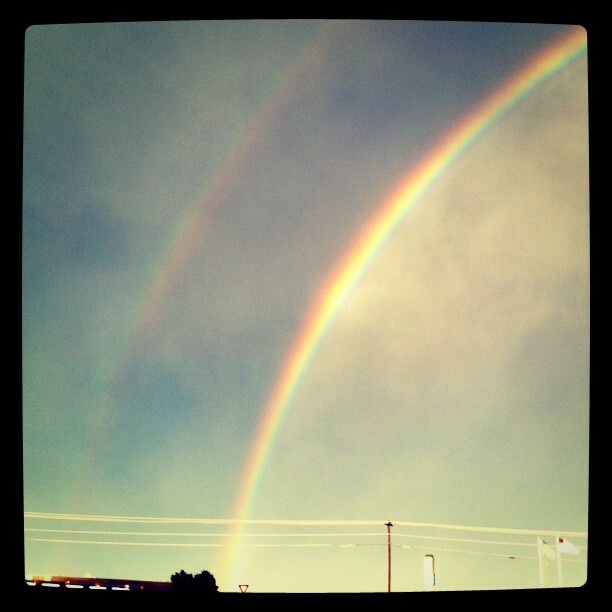 This was the view from my front yard last night: the brightest, fullest double rainbow I had ever seen. This was the sight we all witnessed shortly after the tornado struck Joplin last night, a town that’s about an hour down I-44 from Springfield. I was sitting with my roller derby sisters at Bumsteads in Nixa yesterday when we learned about the tornado. The scary thing is, many of us had just driven through that town—or drove through shortly after it hit—on our way home from Oklahoma City, where we had played a bout the night before. Eighty nine are dead. Seventy percent of the town is flattened. Fortunately, my friends in Joplin are okay. Still, I read Facebook today and my heart was sinking. There’s devastation practically in my backyard, plus there seems to be so much heartache happening in the lives of those around me. My own derby family is brokenhearted over the loss of a roller derby brother from Kansas City. A derby sister just passed the 1 year anniversary of losing her mother, which is an emotional devastation I myself know too well. Another friend is watching her husband slip away and will soon be widowed at 33. Yet another friend’s daughter is fighting an awful disease and continues to be hit with more complications. The list goes on. I am feeling heavy. My heart is going out to all of my friends and loved ones who are dealing with the weight of the world right now. Love, hugs and prayers to all of you.